Are you ready for Donald Trump to become the next President of the United States? You will be-if you buy this book! 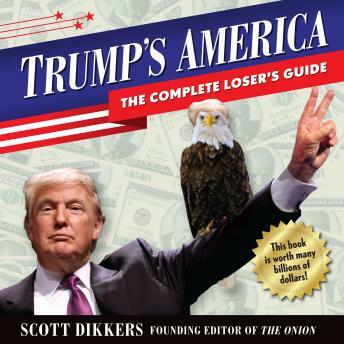 Trump's America: The Complete Loser's Guide is the indispensable handbook you'll need for the looming Trumpocracy. Its colorful infographs and easy-to-skim format give you a complete look at what your life will be like in one nation under Trump. In brief, it will be great.  The secret behind Trump's 30-year campaign for the White House-which isn't even as nice as his other houses!  Trump's plan to mine the nation's mosques for GOLD.  When to offer your wife to President Trump. Don't get Trumped. Get Trump's America: The Complete Loser's Guide, your blueprint for understanding, surviving, and thriving in the coming Trumpocalypse, which could last four to eight years-possibly more!